The late Donald E. Westlake was named a Grand Master by the Mystery Writers of America in 1993, the highest honor bestowed a mystery writer. During the course of his life (12 July 1933 – 31 December 2008) he won their prestigious Edgar Award three times in three different categories; in 1968 for Best Novel, God Save the Mark, in 1990 for Best Short Story, Too Many Crooks, and in 1991 for Best Motion Picture Screenplay, The Grifters. This dandy little thriller was first published in 1960 as The Mercenaries, and it’s Westlake at his best. Like the majority of his crime dramas, The Cutie takes place in New York City, a territory Westlake was highly familiar with and used to color his stories with deft, literary strokes. When a two-bit heroine junkie is framed for the murder of a young actress, the case seems unimportant to mob soldier, George Clayton. As the muscle for underworld boss Ed Ganolese, Clay assumes the murder is inconsequential until Ganolese orders him to find the junkie and hide him from the police. It seems this addict has connections to the Families back in the old country. In an original twist, Clay takes on the role of detective not only find and protect the falsely accused doper, but at the same time learn who the real killer is and bring him to justice. When another woman is killed and the frame put on Clay, things get personal fast. Soon he’s dodging bullets and cops all the while wondering what was so important about a no-talent actress that would warrant someone crossing swords with the mob. The plot is straight forward and moves at a good clip, allowing readers ample opportunity to collect the clues along with Clay and in the end come to the logical, well set up denouement. Westlake’s characters all come to life quickly in short, skillful paragraphs and he cleverly layers their personalities with every day moral issues. Clay is not a mindless thug. He’s an intelligent guy, yet he willfully chose a career of crime. Was it the right choice? By the last chapter of this book, his reassessment brings forth some startling revelations that end the book on the perfect pitch note. The Cutie is terrific crime novel. If I have any quibbles, it is with the beautiful cover by Ken Laager. It has absolutely no bearing on the story, nor is the lethal lovely painted on it in this particular book. Mostly all the Hard Case Crime books’ have featured relevant covers. One or two have not. You can add this one to that short list. Sometimes when a certain writer latches on to a particular character sparks fly. It is as if the two were meant to hook up in the grand cosmic scheme of things literary. Thus is the case with this book. Sean Ellis, a new and exciting thriller writer, first discovered the pulp hero, Secret Agent X, several years ago while contributing to an anthology featuring “the Man of a Thousand Faces.” This B-pulp hero was created back in the 1930s by veteran pulp writer Paul Chadwick for his own title, under the pseudonym Brant House. Chadwick wrote the character’s bible and first half dozen adventures. There would be a total of forty-five in all before the title ended. Secret Agent X is a lone agent who, although sponsored by a cabal of wealthy Americans, chooses his own assignments in defending America from evildoers. His greatest skill is his mastery of disguise and only one other person has ever seen his real face, the beautiful reporter Betty Dale, who is X’s ally and lover. Although never quite as popular as the top tier heroes ala the Shadow and Doc Savage, Secret Agent X captured a strong following which remains loyal to this day. THE SEA WRAITHS is a well written two-fisted, fast paced adventure book. When cargo ships begin disappearing mysteriously in the North Atlantic, America’s top agent launches his own investigation which soon reveals ties to organized crime. But that is only the beginning. He soon discovers other clues that lead him to Nazi Germany and a one on one confrontation with the devil incarnate himself, Adolf Hitler!! Perhaps the most ambitious Secret Agent X tale ever conceived, Ellis brings to it modern day sophistication while at the same time remaining faithful to the traditional pulp trappings of exotic locales, amazing super weapons and daring-do last minutes escapes by a stalwart hero battling against impossible odds. He gives old pulp fans a real treat while at the same time satisfying new readers meeting X for the very first time. And I certainly can’t think of a better way to do so than with this book. THE SEA WRAITHS is pulp fiction at its finest! Here’s hoping Ellis has a few more X tales to spin. This is the best Clive Cussler book I have ever read. No sense mincing words here. Twenty years ago fellow pulp fiction enthusiasts turned me on to Cussler’s adventure series starring an underwater engineer named Dirk Pitt who traveled the world’s seas in the service of an organization known as NUMA. I recall reading what was, by then, the fifth book in that series and instantly becoming hooked on these new, modern day pulp thrillers. I immediately picked up the previous four books, read and enjoyed every single one and was by then a bona fide Dirk Pitt fan. Over the years Cussler, and his editors, have turned the Pitt books into a very successful cottage industry, actually spinning off two other series with the aid of other writers working with the author; the Kurt Austin adventures and the Oregon Files. 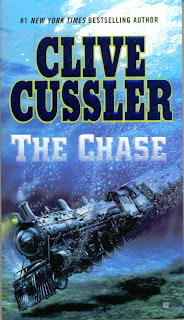 All of which have made Cussler one of the most popular pulp writers in America today. He has millions of fans around the world and his books become instant bestsellers the day they reach bookstore shelves. Which is why THE CHASE almost slipped under my radar of personal interest. I saw it in a store, realized it was a Cussler book I had not read, bought it and then stuck it on stack of to-read titles in my office. Of course as much as I love Cussler’s books, after having read two dozen of them over the past twenty years, it is hard to get overly excited about a new one. Rather they’ve taken on the guise of familiar friends you know will provide you with some fun, but not a whole lot of new experiences. I could not have been more wrong about this particular title and am now kicking myself for not having read it sooner. My first surprise was that THE CHASE is not a Pitt book, nor a part of the other two series mentioned previously. It actually appeared to be a stand-alone offering. My curiosity piqued, I began reading the prologue and before I knew it, I was completely yanked into the narrative as if hypnotized. Once begun, I could not put this book down, it captivated me. 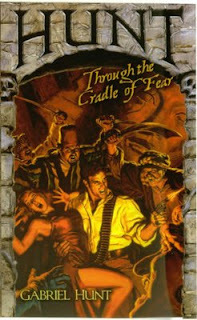 THE CHASE is an historical crime adventure that takes place in the early years of the Twentieth Century. A cunning villain is robbing small western banks. At the same time he kills all the eye witnesses, be they man, woman or child. Thus the local law enforcement agencies are left clueless. Not only are his robberies bold and bloody, but he also manages to elude his pursuers and simply vanishes without a trace after each strike. Enter the book’s protagonist, Isaac Bell, a renown agent of the Van Dorn Detective Agency, a pseudo Pinkerton organization, which has been tasked by the Federal Government to find the “Butcher Bandit” and end his reign of terror. Bell is a unique, clever individual who realizes he is at a great disadvantage as he begins his hunt for the phantom-like outlaw. He quickly assembles a team of agents and operating from the company’s Denver office, begins a methodical campaign to uncover even the most insignificant clues to aid him in both identifying his prey and ultimately bringing him to justice. Cussler weaves a grand tale that masterfully captures the mood and feelings of the times. In the early 1900s, America was on the cusp of a technological golden age, what with the advent of automobiles and electricity, it seemed the old frontiers were quickly being civilized by the marvels of the new. From Denver to San Francisco and many small western hamlets in between, Bell and his men begin beating the bushes. Meanwhile the wily criminal, whose identity is another original twist, soon becomes aware of their presence and sets about plotting their murders. The deadly cat and mouse game begins to take on a frantic pace that is filled with suspense. From a mad car versus locomotive race along the coast of southern California, to the horrendous San Francisco earthquake, Bell’s epic manhunt culminates in a fantastic train chase through the Rocky Mountains that had this reader whipping through the book’s last quarter to reach the amazing finale. Detective Isaac Bell is a great character and easily Clive Cussler’s greatest literary achievement. After a truly magnificent career, THE CHASE, in this humble reader’s opinion, is his masterpiece, and that is not a statement I make lightly. With the second book in this series, creator Charles Ardai becomes Gabriel Hunt, the globe-trotting archeologist. For those of you who came in late, here’s the idea. Ardai , the genius behind the Hard Case Crime books, has invented a modern day pulp hero ala Indiana Jones to mimic the exuberant adventure pulps of the 1930s. He wrote a character bible detailing the history of Hunt and his family and sent it off to five writers inviting each of them to contribute a book to the series, reserving one for himself. In the grand tradition of pulp pen-names, all of the books are credited to the character himself. Of course with any such series, a formula is quickly established and that becomes a mutual blessing and curse. A blessing in that any reader who picks up any one of these six books and comes away enjoying the experience will most likely like the other five. A curse in that after two or three of them, it’s hard not to second guess what comes next in the tale. In both this and the first book, HUNT AT THE WELL OF ETERNITY, by James Reasoner, Gabriel Hunt comes to the aid of a beautiful woman whose life is in danger because of some knowledge she possesses. In attempting to solve the mystery involved with the woman, Hunt is sent on a continent spanning quest, with each clue discovered leading to as yet another exotic locale. THROUGH THE CRADLE OF FEAR begins in Hungary, jumps to New York and then barrels off to Egypt and Greece before reaching its climax in Shri Lanka. This time Hunt is involved with the ancient myth of the Sphinx, that bizarre creature made of parts from multiple animals and possessing the head of a man. The villains here believe the riddle of the Sphinx contains information about a powerful weapon capable of immobilizing armies with paralyzing fear. Ardai understands the fast pacing require of this genre and its obvious he had fun devising hair-raising traps for his hero to battle through, all of them coming at break-neck speed. All well and good, but it wasn’t these action sequences that won me over as much as the all too brief glimpses into Gabriel Hunt’s family life. Gabriel is the oldest of three children whose parents disappeared in a flight over the Mediterranean seven years ago. Now his younger brother Michael runs the Hunt Foundation that bankrolls his archeological expeditions. Shortly after the loss of their parents, their younger sister Lucy vanished. Regardless of whatever case he is involved with, Gabriel Hunt is a haunted man in regards to these losses. When a strange twist of fate allows him to reconnect with one of these three, Hunt’s character takes on a more complex personality which saves him from becoming a cardboard hero caricature. It’s these insights we hope to see more of in the future. I also appreciated the supernatural elements weaving themselves into the action and found the ending terrific fun. Oh, and Ardai also adds a bonus short story after the Hunt adventure, making this book a really nice buy. This is a good series that seems to be picking up steam with each new entry. Hopefully that will continue when number three appears later this summer. This reader will be keeping an eye out for it.